Hey friends, these days data recovery is one of the biggest challenges whether recovering for smartphones or PC. There is a very precious memory like photographs, videos or important files which are corrupted by some malicious software. Also, there are many ways through which your can data corrupt like the malfunction of your hard disk and others. But the main reason for corruption of data due to virus or worms. Since there is much powerful software such as windows defender or antivirus which can stop them incoming to your system. Sometimes they break through and remove the important files from your PC. At that time you start to search for best data recovery software but there is so many software available in the market. This creates confusion which best data recovery software to use and choose among that software which is the best for you to use. In this article, I will tell about the best data recovery software to recover your data. Some of them are free to use and some are free as well as if you want more features you can get paid version of that software. How does the data loss affect us? Data loss is one of the most common problems whether you are working in the corporate world or a personal level. If you are working at the professional sector the loss of data means lots of money and time will waste on recovering the data. This sometimes also effects your career. If you are working in a corporate world then there should be backup of your data if not it takes a long time, money and stress to recover the lost data. So the best way to avoid data loss is to prepare backup data when your work is finished. In case if it is lost then there are software through which you can recover your data. I would recommend going to the specialist if you don’t know the procedure otherwise you can recover by yourself if you know the correct procedure. The data loss affects our personal lives as well because when your data is lost it creates huge stress in mind. We start to think about whether the data is able to recover or not. But we are unaware of the technologies advancement that your data can be recovered easily by using the software. Whether you have smartphones or PC all the data will be recovered if you know about the software. Since many software is available in the market that can recover your data. In this article, I will tell you about the best data recovery software by which you can recover your data easily. One of the best data recovery software to recover data. The Disk drill was formerly known as the 7 Data Recovery software. The free version of this software can recover the data up to 500 MB. This is the most reliable software and easy to use. The other functions of this software are it can do the scanning feature which comes up free with the software. The best usage of this software is if want hard drive recovery then this can be done very easily. If you want to recover more than 500 MB then you have to go for the premium version. The pro version will cost you around $89 in which you will get various new features. Get unlimited scanning of on the premium feature with multiple advance recovery algorithm which includes quick scan and deep scan for complex situations. Disk Drill can read and recover data from the USB storage, data card or any other devices which can be read by the computer. All the data of that particular storage device can be recovered. 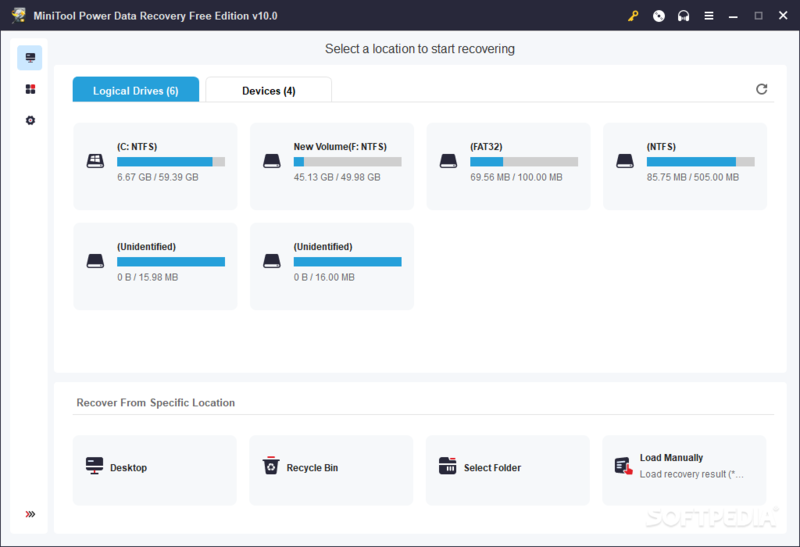 The recovery software provides you with the advanced partition recovery tool if your disk partition gets damage. Disk Drill Pro can heal any of the partition damage. One of the best features of this software is the recovery vault. If you take necessary protection at an early stage by creating a recovery vault in Disk Drill Pro then there no tension for the loss of your file. The recovery vault keeps your file and data safe. Disk Drill is flexible with the recovery of all storage device such as mass storage device, USB thumb drive, internal hard drives, laptops and desktop, digital camera and memory cards. It can read all the file extensions such as NTFS, FAT32, EXT, HFS+ and many other file systems. The Disk Drill Pro can support all the window base such as Windows XP+, Windows 7, Windows Vista, Windows 10. Another best data recovery software. In this software, during the free trails, you can recover your data up to 1 GB. The software is eligible to read all kinds of extension such as FAT 16, NTFS, FAT32, EXT, HFS+ and many other file systems. Mini Tool can recover data from the corrupted HDD, SSD, USB Flash drive and Memory card and stick. This tool can even recover your android as well as ios devices. The free data recovery is up to 1 GB. If you want to recover more data than you can go for the premium packs which costs you are $129 with which you can unlock all the premium features. The features such as unlimited backup etc. You can recover files if accidentally deleted, shift deleted file or the file from an empty recycle bin. The Mini Tool is capable of recovering all those lost files and data. Sometimes the partition is inaccessible to you then you can use this tool to recover the partition easily. When the virus attacks it corrupts all the file and data but with the help of this software, you can recover your files and data even after the malware attack. Also, it can recover data from the corrupted hard drives or the hard drives which are dead. Use this tool to recover your data. Even it can recover data when your operating system is crashed and also recovers data from the dead PC. You can recover your file and data if you accidentally remove the partition or lost the partition after the reinstallation of the window. Recover your data from the corrupted disks such as CD/DVD or sometimes due to unexpected power loss your current data on the system is lost. This lost data can be recover by using Mini Tool. Recover your file from the USB storage device and other storage devices. The tool is compatible with all version s of windows such as Windows XP/7/8/10 and Windows Server OS. If you want good services at lower prices then Prosoft Data Rescue is the best option. You can get backup of your files and data at a minimal cost of $20. If you want better service at minimal cost then my recommendation is this software. The tool can replicate or clone any type of data or file from the corrupted partition, hard disk, USB storage device and more. Most of the extensions are readable by this tool such as the NTFS, FAT32, EXT, HFS+ and many other file systems. Also, the tool is user-friendly and automation technology through which it can make back up file on its own. The tool shows you the deleted file before taking the back up of that data. You can remove the file which you do not require for backup. Simple Copy:- This is the basic feature in which you make a backup of your hard drive. The recently deleted part from the hard drive will be shown to you and you can simply make a backup of removed data. Clone:- In cloning procedure simply with the help of the tool you have to clone your data. Means make a copy of that hard drive and whole data will get copied to the clone drive. Sometimes when the disk doesn’t respond or disk gets corrupted then this clone bootable disk comes in handy. Synchronize:- In this feature, you merge two or more folders or drives into one drive. This type of synchronize comes in handy. Whenever you made a change in any one of those folders or drives the data in the synchronized folder or drive also changes. If anything happens to one of your drives then no problem all your data can be found in the Synchronize drive. The software is compatible with all the versions of windows such as Windows 7 or later. Another thing is the requirement of permission from the local administrator. The space required for the storage of the application is around 157 MB. If you want some high standard data recovery software then you can rely on Recuva. One of the most trusted and thousands of happy customers. The tool has excellence in recovering the lost or deleted data. Recuva can recover data or files from recycle bin, MP3, window computer or digital computer. If you are using the free version of Recuva then there is a limit of recovering your data. For the free version that data recovery lies from 500 MB to 1 GB. To recover more than that you need to upgrade to Recuva Pro where you will get Advance file recovery, Virtual hard drive support, Automatic updates, and Premium support. The Recuva is known for its superior file recovery system. If you lost any kind of file whether it is a photograph, mp3 or any videos. Also, it can recover the data from the rewritable devices such as the hard disk, USB flash drive or memory cards. The most important feature of this tool is that it can recover data even your disk is damaged or corrupted. Also, it can recover data from the newly formatted drive. Hence it is a very powerful tool. Deep scan feature of this software recovers the data if it finds any traces of the file in the system. Sometimes you delete the important the deep scan feature scans the system. If it finds the traces of the file you deleted then it will recover it and show it to you. Another best feature of this tool is that sometimes you delete the file and you don’t want to recover it. Then the Recuva overwrite secure feature can be used. It has high-grade industry and military standard deletion system so it is hard to recover those deleted files. The Recuva data recovery software is compatible all the versions of windows starting from windows 7/vista/10. The tool can read almost all the extensions such as NTFS, FAT32, EXT, HFS+ and many other file systems. So, friends, you don’t have to worry if you lost your data. You can use one the above tool to recover your data but if you know the correct procedure. My suggestion is before using any of the software learn about its merit and demerits. Since some of the software are not able to recover the whole data. If it is necessary and wants to avail more features then use the paid version or premium version of that software. In short, you can recover your data easily with the help of the above software. Tell me in comment box which best data recovery software you like the most for recovering your lost data. If you like this article share with your friends who lost their data and unable to recover them. Drop a comment regarding the article. Thank you for the valuable time reading this article.